However, the technique is still used by relatively few companies. One barrier to setting up these event-triggered email sequences is the time it takes to specify the sequences if it's a new approach to the company or agency. The great benefits of event-triggered e-mails is that once set up and tested for effectiveness, they are a low-cost method of boosting response. You can let the technology take the strain since there are too many triggers and layers of segmentation to manage manually. 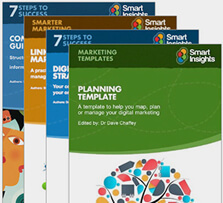 Mark Brownlow has more on the whys and wherefores of event triggered campaigns in this post on Email Marketing Reports. I think that the reason event-triggered emails are underused is that maybe many companies are still in a campaign mindset. To setup event-triggered email does need investment in a project to work through the relevant creative treatment and targeting for different customer actions and position in the lifecycle. Many are maybe unaware that even low-cost email marketing tools may include this feature. 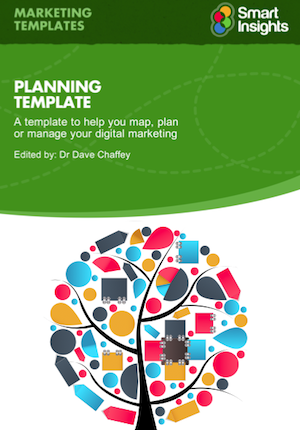 To help marketers and consultants through the process of quickly creating a campaign we have created a email sequence planning template. It was initially developed for a client who needed an event-triggered "Welcome" email sequence based around a brochure download. It's a classic inbound/permission marketing lead generation approach which can be used for B2C or B2B campaigns where access to content or a trial service is given in return for an individual's details. 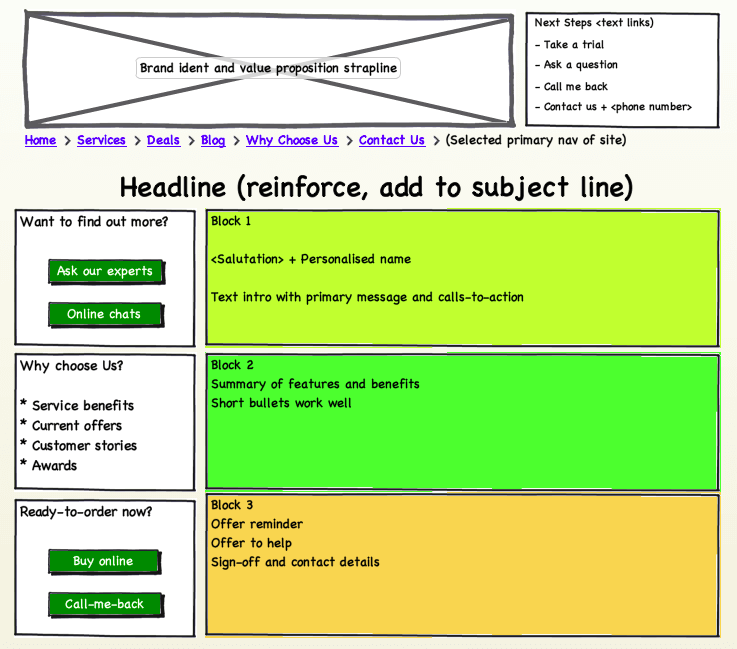 Recommended Template: Email sequence contact strategy templateThis spreadsheet provides a template for marketers to create a messaging sequence that supports their business for the range of potential event-triggered campaigns.Download our email sequence template. This top-level approach shows the sequence of messaging in different media to be automatically generated in response to different triggers forming the business rules. This more detailed example shows how a personalised communication can be specified within different blocks of a template - it's part of our template for planning welcome sequences. This is the creative that corresponds to the contact strategy defined above. It is simplified into clear blocks that can be tailored for different waves in the campaign. The left sidebar which has a high visual emphasis, so is good for response is fixed and covers both branding and response goals. We like the simplicity of Balsamiq for mocking up these types of layouts. 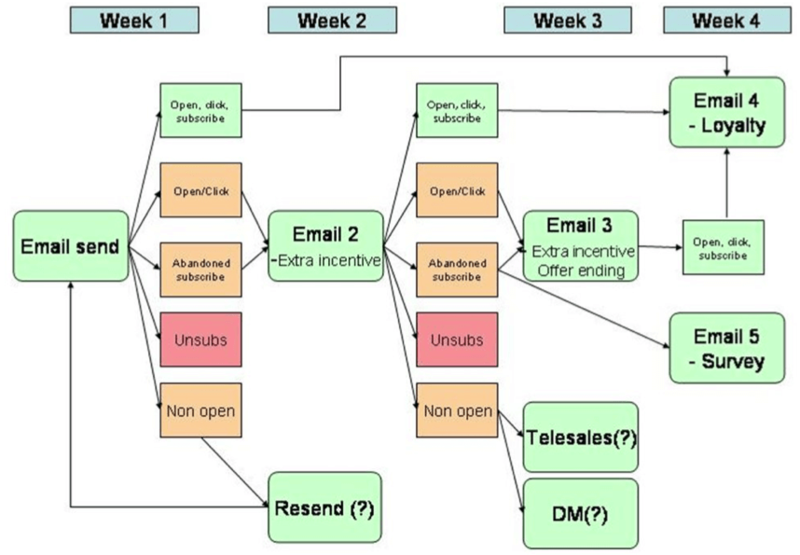 This example gives a more visual representation of a multi-wave campaign through time showing the "Sense and respond" or "digital body language" approach where follow up triggered communications depend on whether the email has been open or which links have been clicked upon. A super-intelligent approach assesses the value of the customer and their propensity to convert and then follows up with the most appropriate medium to gain conversion. So a high-value customer may receive a phone call or direct mail which could maximise conversion. Advice on how to use online channels for welcoming new customers to showcase brand and product value and provide a good experience to adopting a new product or services and best practice tips on using digital communications to encourage loyalty and advocacy building on initial onboarding..